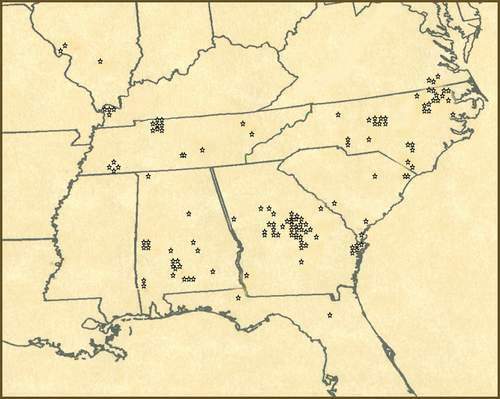 The following maps provide an overall picture of the Brantley population expansion and migrations beginning in 1748. By all evidence, Edward who immigrated to Isle of Wight County in 1638, and his descendants, remained there until that time. We see that year (1748) the grant of land to Lewis Brantley in Edgecombe County (later Granville County), North Carolina. It was soon followed by grants to his brothers, John and Joseph Brantley. These men were all great grandsons of Edward, through son, Phillip, and Phillip's son, Edward (d1736). Another brother, James, had died earlier (1740) in Virginia, yet his sons too, by 1760, were moving into the northeast section of North Carolina. 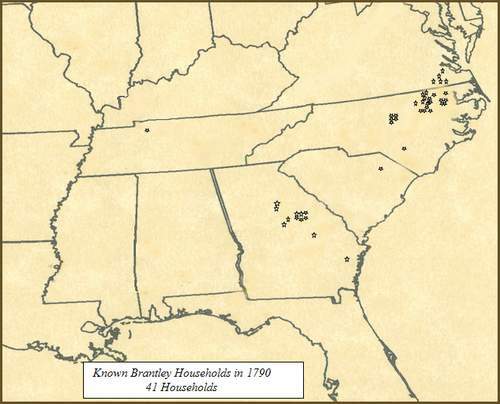 The bulk of the Brantley population today, descend from these sons of Edward Brantley (d1736). The map of 1760 shows the households (HH) of these men and some of their grown descendants who have migrated to North Carolina, as well as the other men of Virginia who descended from Edward's (d 1736), siblings and uncles. 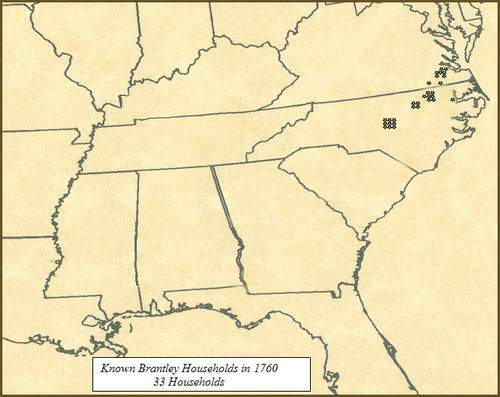 It has been a remarkable observation to see that, while many descendants may exist, comparatively, very few of these who remained in Virginia have descendants, surnamed Brantley or Brantly, living among us today. While those of Edward (d1736) who migrated south, have multitudes, they have very few. From what we can see, less than 8% of the Brantley households in 1900 are descendants of these other men of Virginia. 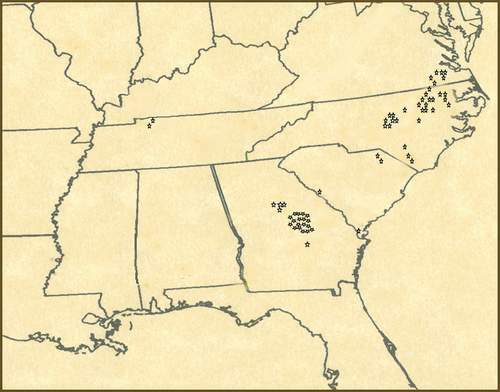 By 1764, we see the movement of Brantley families into Georgia. Those of Thomas, James and John were in Burke County, within less of a mile of each other, that year. Others to Wilkes County came in 1777 and 1784 from Chatham County, North Carolina. By 1790, most of the Brantley population was in North Carolina and Georgia (see map). All these men, then in Georgia, are, obviously, descendants of the early immigrants to North Carolina. 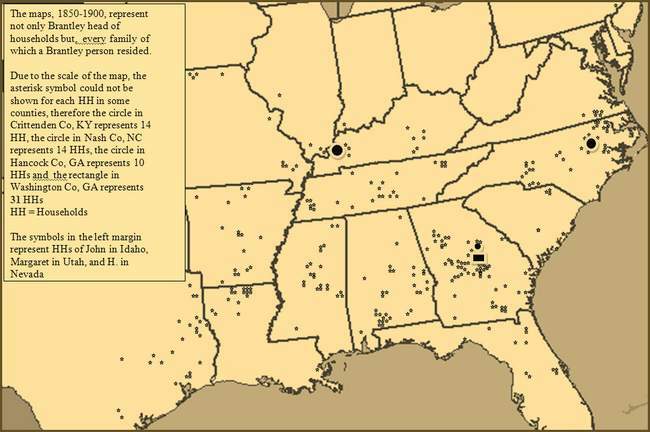 The claim by researchers of generations passed that Edward Brantly (I) was the ancestor to the entire white Brantley population is heavily supported by the evidence and movements of the family as shown in the population expansion. No Brantleys are found in the north for two hundred years after the arrival of Edward of 1638. Even as late as 1850, except for a census entry of two Irishmen in Wisconsin, all Brantleys in America are living in or, were born in the south and clearly show solid evidence of roots back to Edward. 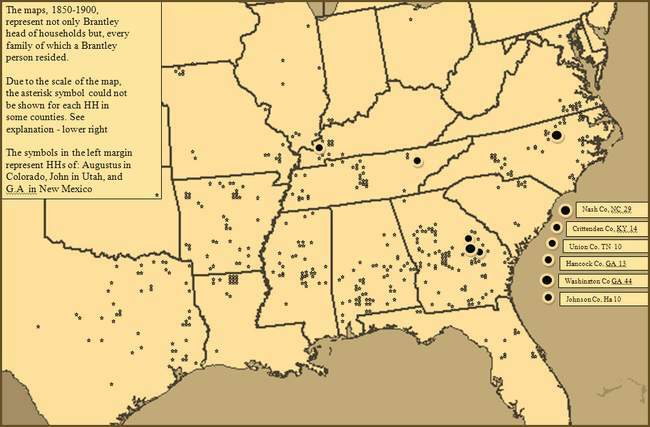 The following analysis and maps depicts the movement of the Brantley population, generally south and westward, through 1900. 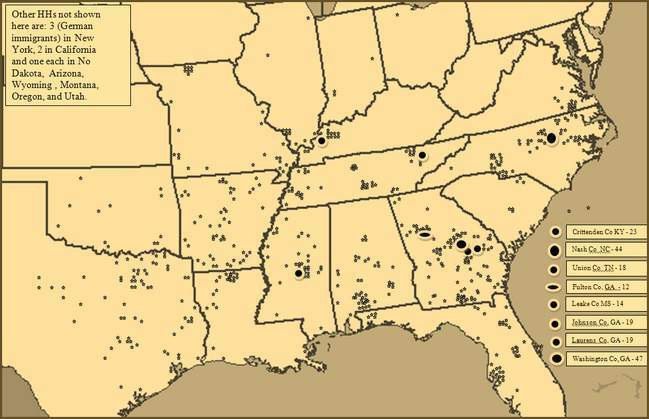 Except for the North Carolina census data which survived the Capital fire of the War of 1812, the data presented in years preceding 1820, are based on our vast collection of tax and deed records found throughout the south during the respective census years. The data in 1820 and afterwards is based almost exclusively by reference to census data. 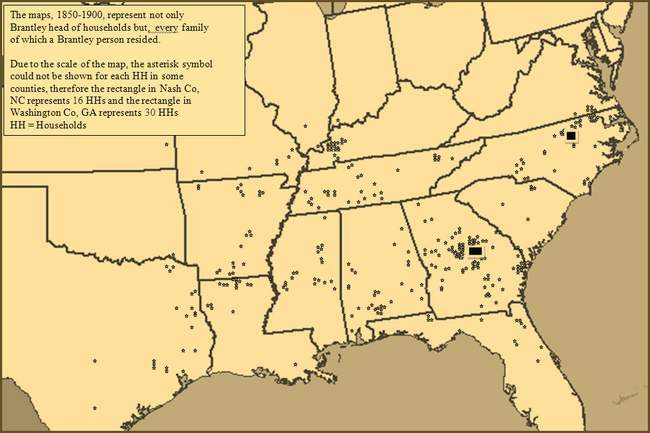 We will see from the statistics below that the greatest population of Brantleys shifted from North Carolina in 1790, to Georgia by 1820. Georgia borders held that distinction through 1900 and, we will assume, even today. 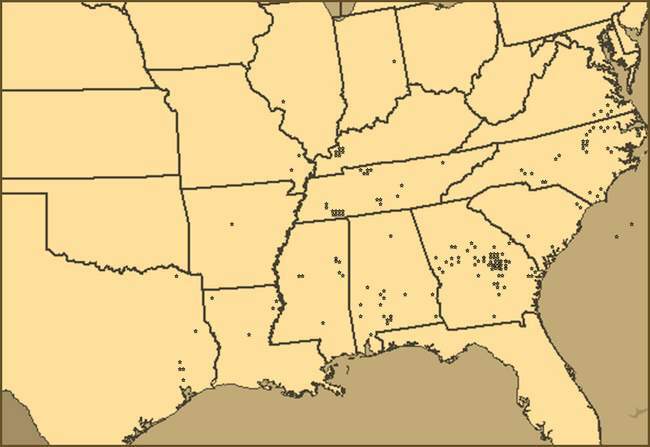 By 1830 families were also in Alabama, Kentucky, Tennessee, and Illinois. 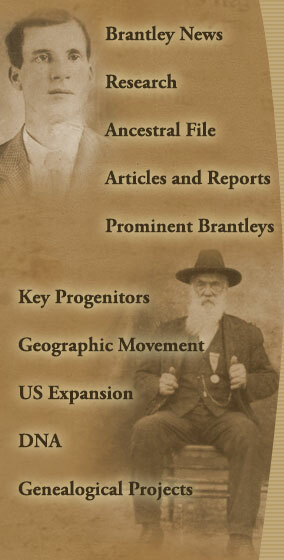 By 1840 Mississippi, Arkansas, Louisiana, Missouri, and even Texas had become home States for Brantleys. It is, as expected, almost always shown that the migration was southward, or westward. The movement back eastward or northward was indeed unusual, through 1900. 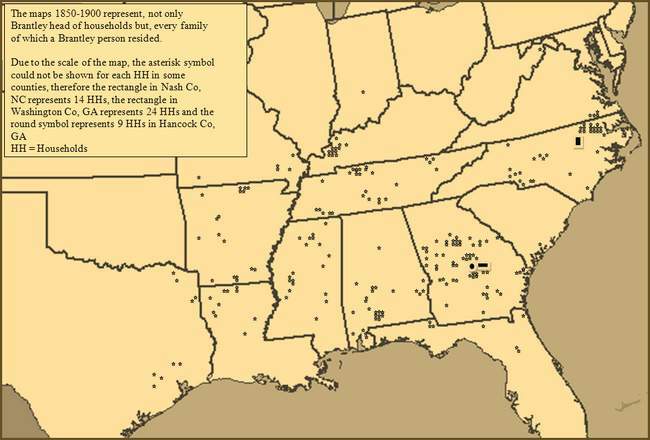 The following population 1740 - 1810 is based on a limited census collection and a life time of study of the Brantley family in America. It cannot however be considered conclusive. Many lived and died who never appeared in a record that has survived to our day. This is only a thumbnail sketch. For more detailed census information by state and downloadable maps please click here.